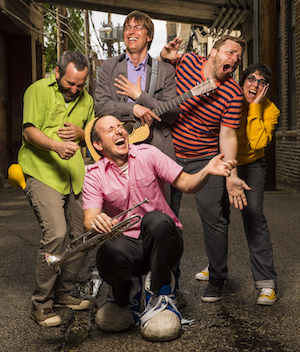 Grammy-nominated Justin Roberts and The Not Ready for Naptime Players will dish out intelligent and whimsically rocking music for kids and their parents at Smothers Theatre in Malibu on Saturday, January 21, at 11 AM and 1 PM. Attending guests can also enjoy Family Art Day activities hosted by Pepperdine University from 10 AM to 1 PM. This free event is open to the public and features hands-on art projects, backstage tours, as well as tours of the Frederick R. Weisman Museum on campus. For nearly 20 years, Roberts has been creating the soundtrack to families’ lives, helping kids navigate the joys and sorrows of growing up while parents remember their own childhoods. Along with his band, The Not Ready for Naptime Players, they have travelled the globe, from Hong Kong to New York, and Miami to Seattle. Roberts began his music career in the 90s, performing in the Minneapolis-based indie-rock band Pimentos for Gus. He decided to “moonlight” as a Montessori preschool teacher. Soon after he began writing and singing songs for a new generation of fans: his students. The kids immediately responded and inspired Roberts to record some of his new songs and send them out to a few friends for Christmas. One of the gift recipients was Liam Davis, a college pal and music producer, who suggested that they record the songs professionally. In 1997 Roberts released his first album, Great Big Sun, and the critics took note. His music was soon being compared to everyone from Elvis Costello and Fountains of Wayne to Paul Simon, ELO, and Nick Lowe. Roberts has performed in front of millions of people on The Today Show, has been featured on Nick Jr. TV, and his song "Get Me Some Glasses" was on a World Series broadcast. He’s received two Grammy nominations, for Jungle Gym in 2011 and Recess in 2013. In 2014 Roberts wrote his first musical based on Hansel & Gretel, produced a cast recording, and published his first picture book, The Smallest Girl in the Smallest Grade (illustrated by Christian Robinson) with Putnam. In 2015 he created a concert/theatrical experience entitled The Mysterious Hat, which debuted Off-Broadway at the New Victory Theater in New York City. In October 2016 Roberts released his new album, Lemonade—his 13th album for families with 12 new original songs. Featuring dynamic performances by Chicago superstars Robbie Fulks on lead acoustic guitar and banjo, Gerald Dowd on cardboard boxes, paint cans, salt shakers, and other homemade percussion, and John Abbey on upright bass, Lemonade is like no other Roberts recording. The sparse sounds are dotted with ukulele, piano, cello, fiddle, marimba, harpsichord, and lovely harmonies by Nora O’Connor (Neko Case, Decemberists), Anna Jacobson, Robbie Fulks, Liam Davis, and Gerald Dowd. Recent appearances include performances at NYC's New Victory Theater, D.C.'s National Geographic Live, L.A.'s Getty Museum, Seattle's Moore Theater, Lollapalooza, Austin City Limits, and Chicago's Ravinia. Ticket prices range between $10 and $15, and are required for attendance. For additional information about the performances, and to purchase tickets, visit the Center for the Arts website.